VersaPost - The Steel Post for Wood Privacy Fences. The VersaPost gives you the beauty of wood and the strength of steel. The VersaPost is the strongest and most economical steel post for wood fences. Get the beauty of a real wood fence that will last a lifetime. The post itself is the key to how long a wood fence will last. Wood posts are susceptible to decay. Steel posts will last forever. 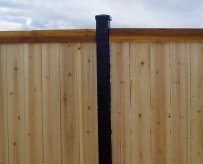 With the VersaPost you can have a beautiful wood fence with steel posts. The VersaPost is proudly made in America --- by American workers. Why put the money and time into a wood privacy fence only to have the posts rot out in just a few years? When the cost of concrete and gravel are included the VersaPost does not cost much more than a wood post. Use our concrete calculator and see for yourself. The VersaPost functions as a line, end, corner or gate post. It requires no special clips or brackets. With the VersaPost the entire fence can be installed by one person. The major drawback of a steel post is that they are not very attractive. But with the VersaPost you get a steel post and the beautiful look of wood. The VersaPost can be covered with a fence picket, made to look like a wood 4 x 4 or even a black iron post. The VersaPost is the most versatile steel fence post on the market. And, it is easier to install than other metal fence posts. Wood Fences Can be Maintenance Free. Many people assume that wood fences require a lot of work to maintain. But a wood fence can actually require very little maintenance - if any at all. The key to a long lasting wood fence is the post. By using steel posts a wood fence can be built that will last for years with very little upkeep. "Happy holidays from Oregon, and thanks for your ingenious product!" Always use high quality wood for the rails and pickets. Cedar is the standard as it is naturally rot-resistant. We recommend full-cut cedar stringers and thick rough-surface pickets. Contrary to popular opinion, cedar fences do not need to be stained or painted. Cedar when left untreated will over time turn a beautiful shade of gray. Composite and vinyl fence companies try to mimic this gray color. Names such as "Weathered Cedar", "Cape Cod Gray", "Natural Cedar" and others are used to describe these products. But there is no need to spend a lot of money to get this color. For a maintenance free wood fence simply let the cedar weather. If you like, the fence can also be stained a light gray initially. As the stain eventually wears off the wood will show its own natural gray color. Do not want a gray fence? 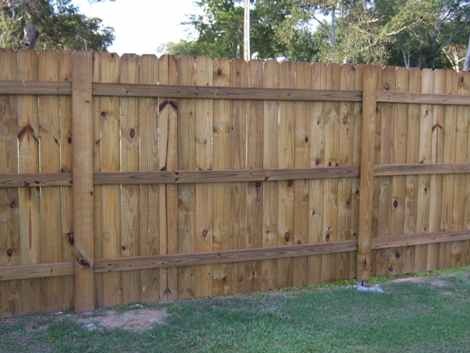 Wood fences can also stained almost any color imaginable. When correctly applied the stain will last for many years. Always use a high quality oil-based stain. Apply the stain with a garden sprayer and then work the stain into the wood with a short bristle brush. 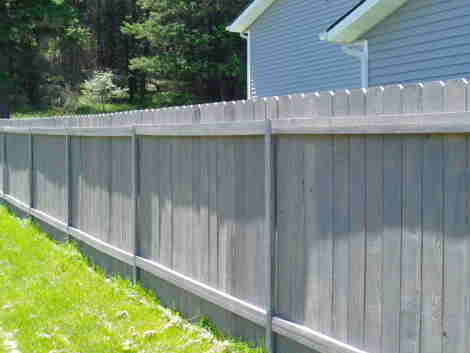 A properly stained wood fence will not require re-staining for 10-15 years. "Let me say "kudos" on a wonderfully designed VersaPost."